Warsaw is the capital of our homeland, Poland. To be honest, we’ve never really liked this city. It was too big, too busy and too overwhelming. Every time we traveled, we met some people who were telling us how awesome Warsaw is. They said it’s better than Kraków or Zakopane. We decided to give it a try (again!) and discover the beauty of Polish capital. We are proud to announce that we’ve made it! It was surprisingly easy to fall in love with this city. All we needed to do is to find some things to see in Warsaw for couples. The capital of our homeland has so many hidden gems that we can’t wait to come back there to discover more. We’ve created this Warsaw romantic guide to show you all the places we have visited this time. We don’t like to party hard in the clubs or visit hipster spots. We like to travel off the beaten path, being close to nature and learn something new about the place we are visiting. This romantic guide to Warsaw is perfect for the couples, families and all the other tender-hearted souls who want to discover the idyllic side of the Polish capital. Looking for best Warsaw travel tips for couples? Keep on reading and plan your trip to the capital of Poland with this romantic guide. The Wilanów Palace is one of the few buildings that survived two World Wars. Most of the amazing architecture of Warsaw was totally destroyed. This beautiful baroque castle was built in 17th century by one of the best Polish kings: Jan III Sobieski. Not only was he the great ruler but also a loving husband. The romantic letters that he has written to his wife, Marysieńka, are famous to this day. 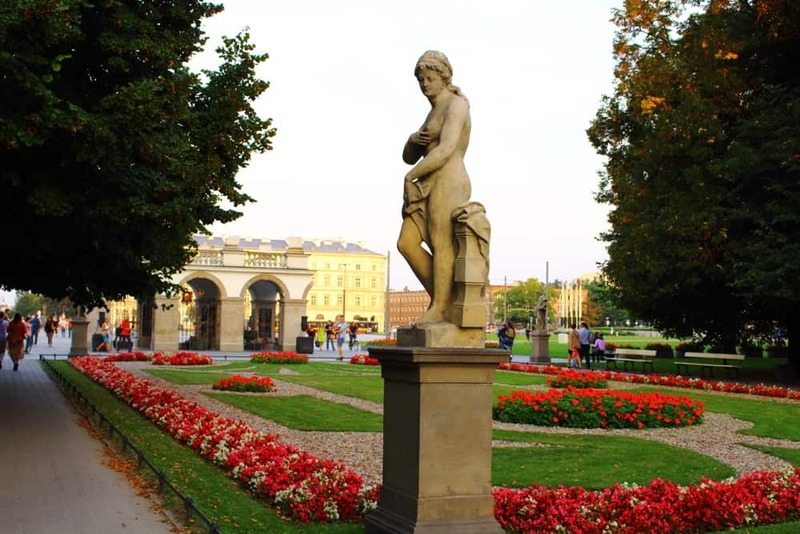 It makes Wilanow one of the most romantic things to see in Warsaw. The palace is surrounded by the beautiful garden. It is a great place to relax and unwind in the capital of Poland. What can be better than a romantic walk with someone you love? If you want to get the most of your visit in Wilanow, book a private tour. Warsaw travel tips: Most tourist don’t know that there is a lake close to the palace. You can rent a boat there and take a romantic Warsaw cruise with your partner. Wilanow Palace is one of the most beautiful places in Warsaw. This cute love bridge is the most romantic hidden gem of Poland! It is located quite close to the palace in Wilanow and it’s the best to visit at night. The three hearts that you can see on the picture below are beautifully highlighted after dark. Like in most other places in the world, lovers are hanging the padlocks on the bridge, promising each other the eternal love. According to the tradition, they need to throw away the key to the river afterwards. Visiting Love Heart Bridge is one of the best free things to do in Warsaw for couples. 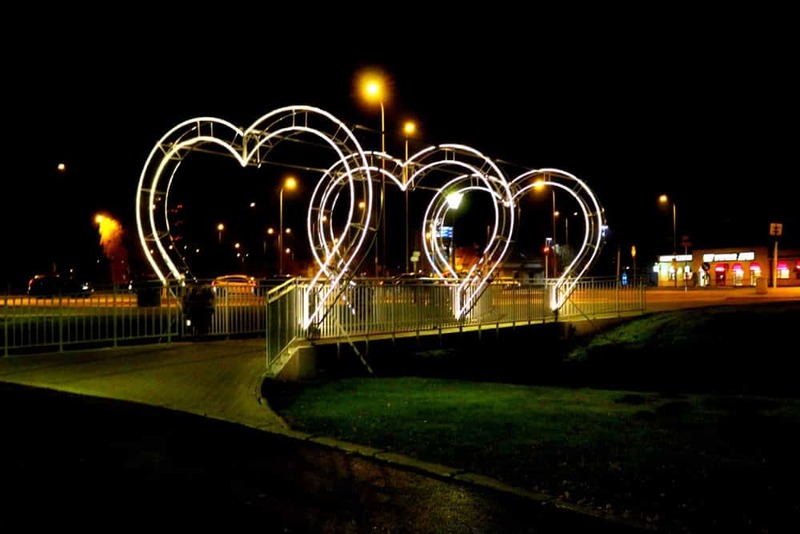 If you are looking for an unusual things to do in Warsaw, visit Heart Bridge close to Wilanow. It is one of the most romantic places in Warsaw. Fotoplastikon was very popular in the past, especially in the short period between the First and the Second World War. Couples were going there for a date. They could see the places that weren’t available for everyone. Where else could you watch wild African lions or the modern landscape of New York City? Fotoplastikon is a place unique on a global scale. It has a specific atmosphere that cannot be compared to anything else. If you want to read more about this amazing spot, check out this post. TIP: One of the most popular Warsaw shopping mall is located across the street from Fotoplastikon. Go to Zlote Tarasy, if you want to buy some Warsaw souvenirs. 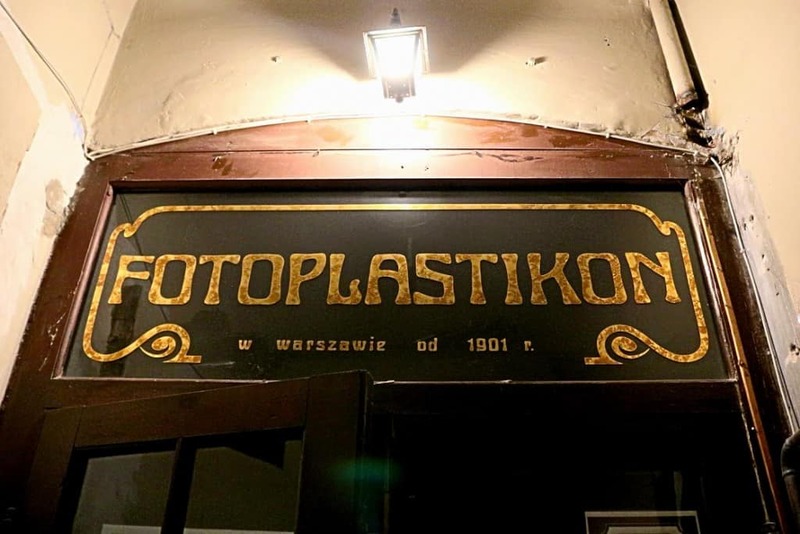 Fotoplastikon should definitely be a part of your Warsaw city tour. Łazienki Królewskie is the biggest park in Warsaw. 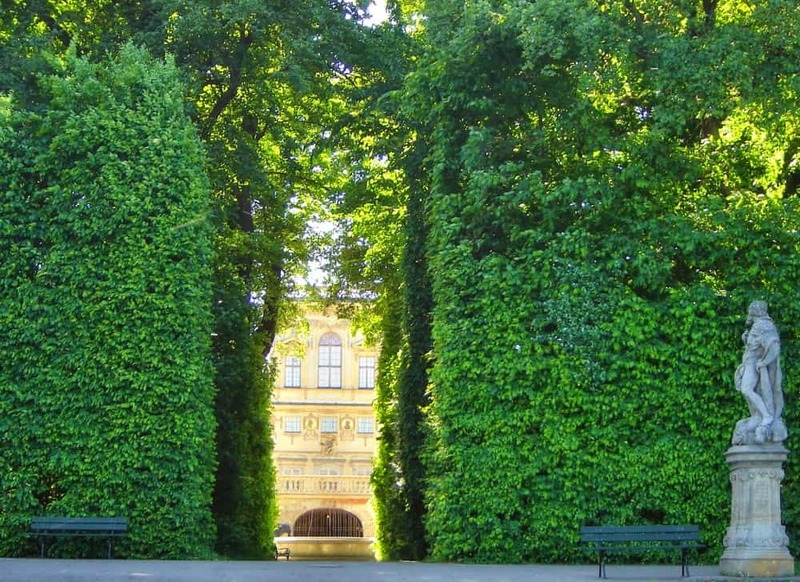 Surprisingly, it’s located in the city centre, so it’s like a green oasis in the heart of the Polish capital. 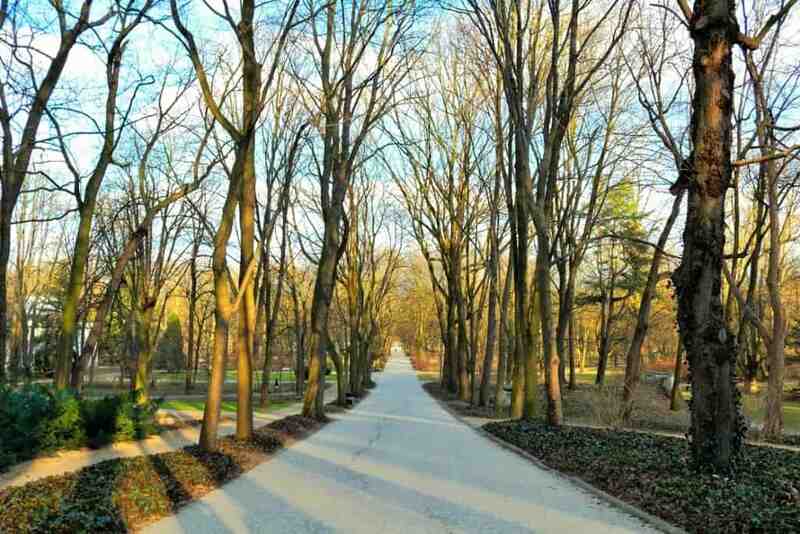 You can spend hours walking around Łazienki. There are many beautiful monuments, restaurants and a lake at the park, so you won’t get bored there. Visiting Lazienki is one of the best Warsaw Poland things to do. Centrum Nauki Kopernik is a perfect idea for a romantic date in Warsaw! 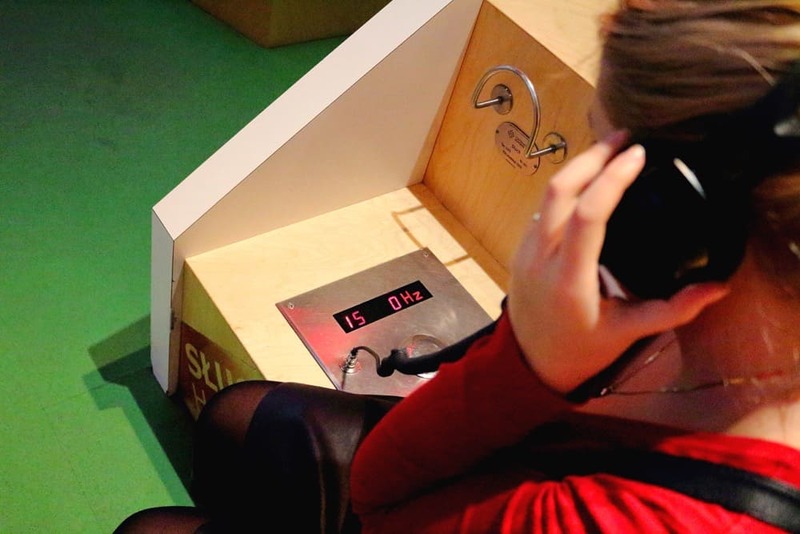 It is an interactive museum where you can learn a lot about the science and the world in general. You can check how you’ll look when you are old or fight the mental battle with your partner (using the willpower). It’s so much fun! We’ve spent few hours at Copernicus Science Centre. For us, it is one of the best museums in Warsaw and the top tourist attraction in the capital of Poland. TIP: With Warsaw city pass, the admission to Copernicus Science Centre, as well as to many other tourist attractions in the city, is free. You can buy Warsaw travel card online or in any Tourist Information Points in the city. Copernicus Science Centre is one of the best museums in Warsaw! Check out also: Neon Museum in Warsaw. For us, Old Town is number 1 of all the cool places in Warsaw. It is perfect to visit all year long. No matter if it’s cold or hot outside, there are always many people at Krakowskie Przedmieście street. 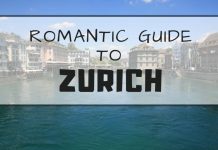 The beautiful architecture, awesome restaurants & cafes and the unique atmosphere are only some of the things you can experience there. Walking around the narrow and empty streets of Old Town is one of the most romantic things to do in Warsaw. If you want to see Warsaw at night, there is no better place to go than the Old Town. 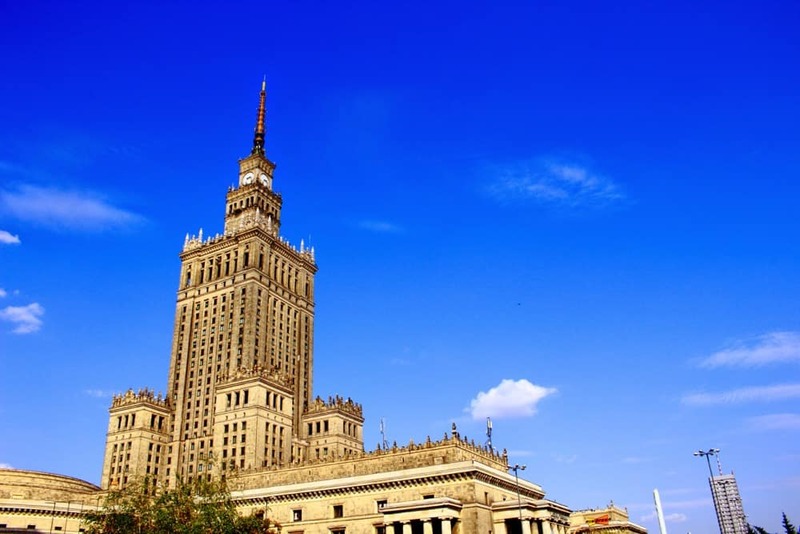 Palace of Culture and Science is a landmark of Poland. It is located in the heart of the city, close to the main bus & train stations. Some people love it, some hate it. It is the remain of communist time in Poland. The specific stalinist architecture of this building can also be found in other post-communist countries like Riga or Moscow. 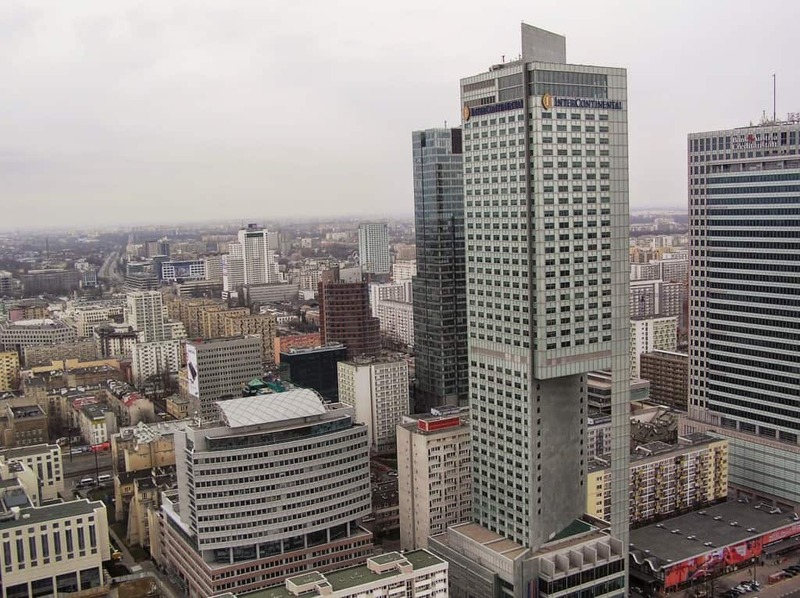 What’s interesting, Pałac Kultury is the tallest building in Poland. You can get almost to the top of it to see the beautiful aerial view of Warsaw. The admission is 20 PLN ($5.5) per person. Going up the Palac Kultury is one of the best things to do in Warsaw in winter, when it’s too cold to walk around. Be sure to go there while sightseeing in Warsaw Poland. 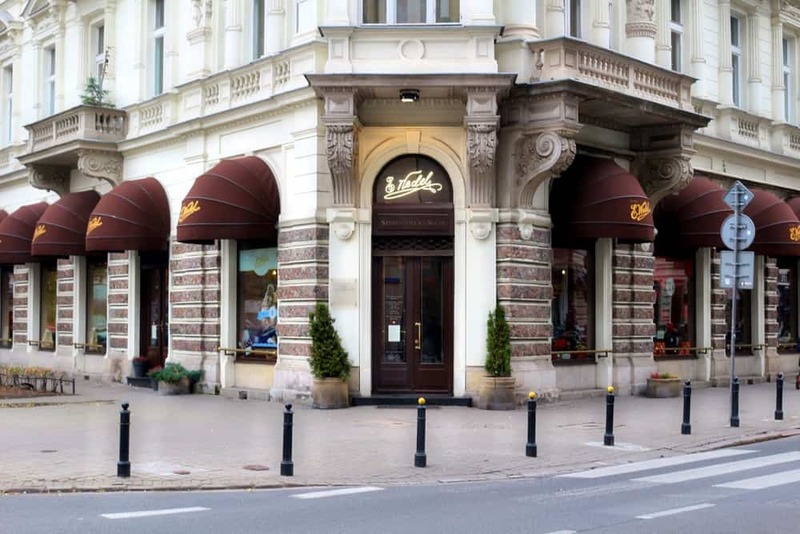 Wedel is the most famous chocolate brand in Poland. They have the old-fashioned store in the heart of Warsaw. It’s definitely one of the best cafes in Warsaw for a date in this city! The old-fashioned store and cozy interiors make you feel like you would go back in time. The intimate atmosphere guarantees the successful date, as it’s one of the best restaurants Warsaw. Looking for the best cafes in Warsaw? Go to E.Wedel chocolate store! While it’s not one of the most unique things to do in Warsaw, it’s always a great idea for a date. If you are looking for best massage Warsaw to go with your partner, consider visiting Tajskie Spa. There is nothing better than a Thai Massage! If you are looking for something more regional, go to My Masujemy. They even have a lesson for couples on how to give each other the best massage! Getting a massage Warsaw is a great idea for a date. If you want to find the best place to stay in Warsaw, be sure to choose the hotel in the city centre. It’s good to have all the tourist attractions within the walking distance. If you are looking for a romantic hotel at an affordable price, check out Mercure Grand located on Krucza street. The modern rooms are fully equipped and have all the facilities you need like fast WiFi and a comfy bed. Check out the latest prices for Mercure Grand—> click here. Wonder where to stay in Warsaw? Choose the hotel in the City Centre. If your budget is a bit higher, consider staying at another romantic hotel Warsaw, Sofitel Victoria. It’s definitely the best Warsaw spa hotel. Located just a few steps from the Presidential Palace and Krakowskie Przedmieście is a perfect accommodation even for the most demanding customers. Check out the latest prices for Sofitel Victoria—> click here. Looking for Warsaw hotel with pool? Book your stay at Sofitel Victoria. It is one of the best places to stay in Warsaw. The easiest way to get around the city is by Warsaw taxi. It’s not the cheapest option though, Warsaw taxi fares may be high. Be sure to set the price before the ride to avoid being ripped off. If you care for your budget, it’s better if you choose taxi alternatives in Warsaw like Blacklane, Warsaw Uber or Taxify (click to get a free ride). You will be sure you are not overpaying for your ride. You can also choose Warsaw public transport. There are only two tube lines in the city, so you’ll probably be traveling by buses or trams. It’s OK though: they are very convenient, cheap and well-organised. 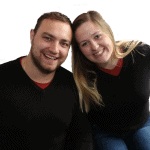 Last but not least: car rent Warsaw. It’s not a good idea if you want to stay in the Old Town area for the entire time. If you want to see more, go to the outskirts of the city or even travel to another region of Poland, then finding a cheap car rental Warsaw company may be a good option for you. Follow this link to find the best car for you. TIP: If you decide to buy a ticket for Warsaw sightseeing bus, you will easily get to all the important tourist attractions in the city. Warsaw is the biggest city in Poland, the best way to get around it is either by taxi or Warsaw public transport. You can always rent car Warsaw, especially if you want to travel outside the city center. The centre of Warsaw is closed for the cars, that’s why the best way to see everything is to join Warsaw walking tour. This 2 hour tour is perfect for everyone. You will see all the important places of Warsaw’s Old Town (and you will have a chance to try traditional Polish cake). The price is really affordable, see more here. Polish cuisine is much more than pierogi! If you want to taste the local dishes and get to know the rich Polish cuisine, join Warsaw food tour. 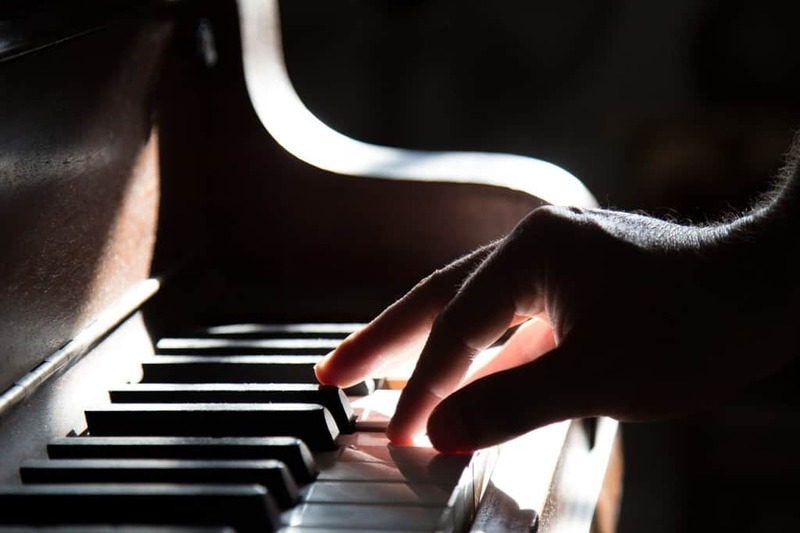 Did you know that one of the greatest musicians of all time, Frederic Chopin (Fryderyk Szopen), was actually Polish? He moved to France to grow his career. Warsaw’s main airport was named after him. While in Poland, it’s worth to go on Warsaw Concert tour to listen to the piano music he composed. Check out Warsaw Concert tour here. While in Poland, be sure to go to Warsaw Concert and listen to the music of Chopin. A good way to explore Warsaw is joining alternative Warsaw city tours by Odd Urban Things. They’ll bring you around Warsaw on a cult fire truck from Communist times and they’ll cover the main attractions as well as some hidden gem! If your time in Poland is limited and all you have is Warsaw layover, check out this tour. They will pick you up at the airport, show you all the important places in the city and drop you off anytime you want. Disclosure: We want to thank Mercure Grand and Sofitel Victoria for complimentary stays. All opinions presented in this post are honest and our own. Strange that I don’t remember seeing any travel lbog posts about Warsaw, ever. People just ignore it in favor of places like Krakow, so good of you to feature its attractions. I like the way you had an earlier impression of it and then gave it another chance. Thanks for your comment, Tom. 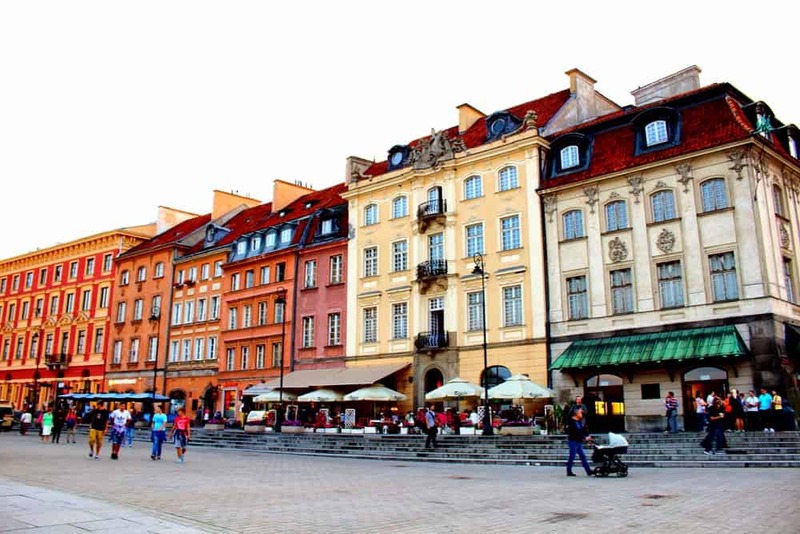 Yes, Krakow is definitely more popular but Warsaw has a lot to offer as well! Hi, Karolina! My husband and I planned a romantic getaway to Warsaw for a weekend, while our daughter is spending some quality time with her grandparents. Your post has been most helpful in planning out stay there. 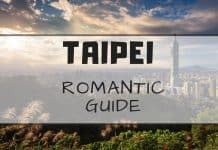 Could you also recommend some mid priced romantic restaurants in the Old town area (we’ll be staying at Ibis) where we could enjoy the local cuisine? And maybe recommend some traditional dishes, as we are not familiar with Polish food. Thank you! Greetings from Romania! Glad you enjoyed our guide! There are two restaurants with traditional Polish food in the Old Town of Warsaw that we can definitely recommend: Podwale25 and Bazyliszek. If you want to visit really romantic place, check out Stary Dom (it’s quite far from the center though). Polish cuisine is very diversified, there are so many dishes that you should try! If you are a meat lover, choose schabowy/sznycel, bigos, gołąbki, kiełbasa or kaszanka. If you prefer vegetarian food, pierogi (dumplings), knedle or rosol is a must. Have fun in Warsaw :). Many tips to know for every couple want to get there; the romantic bridge is a pure gem of Poland, like you said! I have never been in Poland but it’s so close to my home (Sardinia), so maybe I can make a weekend there for Christmas time, it should be amazing! You should definitely visit Poland! It’s one of the best countries in Europe. Love is in the air! I love how you decided to give this place another go, despite your original feelings. 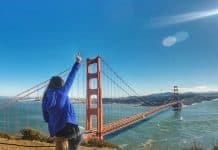 How’s being a tourist in your home country? Thanks Sarah! It’s quite easy to be a tourist even in your homeland. We are traveling full time, so we just feel like tourists everywhere we go :). 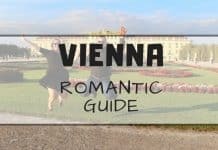 Great list and perfect for a romantic getaway! Would never have associated Warsaw with romantic. That heart bridge looks so pretty. Visiting the heart bridge was definitely a highland of our trip to Warsaw. It’s so romantic! I think this is the first time I read a blog post about Warsaw. 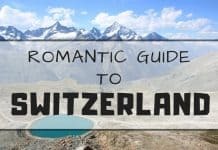 And Its a romantic guide! Okay seeing those gardens and pathway with trees makes it truely romantic.. and its seems not too crowded unlike what others said. Yes, Warsaw is surprisingly romantic! It’s a great destination for the couples. You’re welcome! Hope this post will inspire you to visit Warsaw. I am planning on visiting Poland next year as i have friends living there. I will include Warsaw on my list of cities to visit too, it looks very beautiful. I bet in summer it gets even more wonderful. I like the look of the love bridge, I haven’t seen any other bridge to have hearts built on it. I bet that’s a really good dating spot. Yes, you are right Joanna- Warsaw in the summer is even more beautiful! Poland of me is all about heritage. It never struck me as romantic till I came across this post of yours. Now I have to plan an anniversary getaway here. 🙂 Thanks for sharing this. Poland is not only about awesome monuments- it’s definitely a great destination for the honeymoon or the anniversary trip :). The heart bridge is so cute! I’m not big on romantic things as it’s not what my boyfriend and I tend to do. But I would love to visit a chocolate store – definitely something I would be down to visit! Wedel chocolate store is great! You will definitely love it. Glad you gave it a second chance, the romantic tree lined pathways and Old Town look so picturesque. I also rather enjoy going for a walk and exploring hidden gems in cities rather than overload on too many tourist things or going out to party. Lovely guide! Thanks, Suanlee! You should definitely go to Warsaw next time you will be visiting Europe :). It is strange that a beautiful place like Warsaw hasn’t really been talked about before. I am glad that you introduced it to us that too with a romantic touch. Will save it for future reference. Thanks, Laveena! All the best to you. The 3 heart bridge is gorgeous ! Sounds like the perfect place for a romantic weekend getaway.I love discovering Hidden gems like these.Thank you for sharing. Yes, it is a great place for a romantic weekend getaway! Thanks for showing the different sides of Warsaw! Looks like there’re so many amazing gems out there. Poland is on my wishlist. Hope to go there someday in my life! I like the way you choose to describe Warsaw in romantic way. Bay covered with trees from both sides in Łazienki Królewskie and Wedel Chocolate store I found as the most romantic places. They are indeed very romantic! Thanks for your comment. We haven’t been to Akademia Restaurant but we must go there next time we will be in Warsaw. Your first date seems really romantic! Best wishes to you and your husband :). We were in Poland for 7 days this summer and don’t have much time to visit Warsaw too. But this post is amazing and now I want to come back and visit this city with my friends. We visited many places in Warsaw during our stay, a beautiful place, we fell in love with this charming atmosphere. 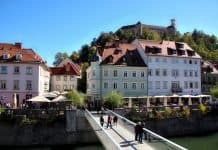 For sightseeing I recommend the Royal Castle as someone is interested in monuments, or if you want to rest then places by the river. The Akademia restaurant is a great place, delicious food and friendly service.